Looking for something unusual which will bring freshness and new look of your interior? 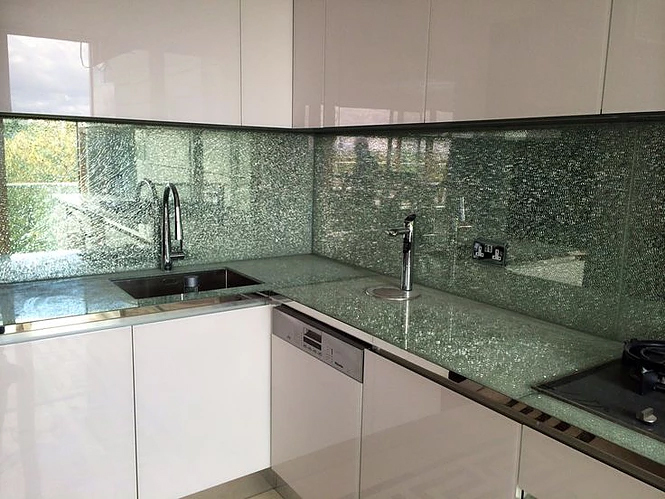 We have a great offer for you - Cracked Ice Glass. It is a great option which can be used as a kitchen backsplash, tabletop or even nice custom made shelf. Cracked Ice Glass is a custom product made of PVB film, annealed and tempered glass which are used in a unique and labor-intensive process to capture this spectacular effect between pieces of glass. It produces a strong and striking contemporary finish to any surface. The rear layer is crack manually for an exciting and spectacular installation process. This cracked layer creates the unique ‘ice cracked’ effect between the pieces of glass. If you are going to use it as a backsplash in your kitchen, we, at Laminated Glass NYC are ready to create one of the most unique glass backsplash finishes. Custom made backsplash is perfectly suitable for use behind hobs and cookers. Cracked Ice Glass comes in different layer and color variations.